Hello ... Hello ... my old friends ... It's great to see you once again! 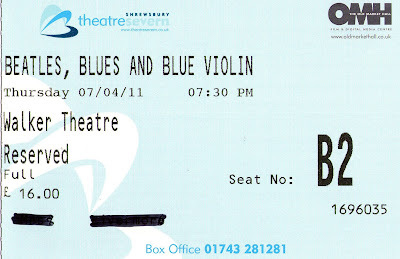 ELOBF appears to be in the middle of a gig glut in March and April this year and one of the absolute pleasures of attending and drinking in live music in the ELO and related musical universe is witnessing a concert such as that performed by The Beatles Blues and Blue Violin Project [BBBV] on the night of Thursday 7th April at The Walker Theatre, a venue located within Theatre Severn beside the beautiful River Severn in the enigmatic county town of Shrewsbury. Travelling the thirty  odd miles to see this group of mature, talented and professional musicians of proven ELO pedigree deliver a set of songs largely written by The Beatles and Jeff Lynne in that unique BBBV style really is a perfect fit for ELO Beatles Forever [ELOBF] - and not necessarily in name only. Phil Bates, Mik Kaminski and Tina McBain [a.k.a. Tina Mac] duly delivered another entertaining set of "folksy, bluesy" interpretations, mostly of Beatles and ELO tracks. This is the fourth time that I've seen BBBV now and I have to say that this trio have become tighter and have matured much as a unit. 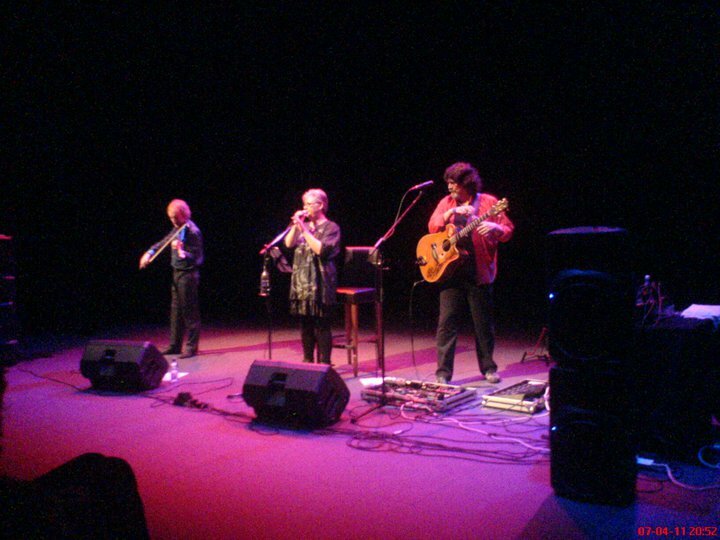 Songs like "Norwegian Wood", "I Am The Walrus", "While My Guitar Gently Weeps", "Why Worry?" and "Motherless Children" were intermingled effortlessly with their twin tributes to the late, great Kelly Groucutt in "Can't Get It Out Of My Head" and "Midnight Blue". ELO Beatles Forever [ELOBF] recommends The Beatles Blues & Blue Violin Project [BBBV] to those enlightened folks who also like ELO, Jeff Lynne, Roy Wood, 'Brum Beat', The Idle Race, The Move, The Beatles and related artistes.